Marcala Thanks to our friends at the small women’s coffee and aloe vera cooperative, COMUCAP, we usually stay at their cabinas high in the mountains. There’s no water or electricity, but the setting is beautiful and the bunks work fine for us. They hope someday eco-tourism will come their way, who knows? We started driving up before dark and a light, intermittent rain quickly turned some of the clay and rock road up the mountain into gumbo. We were almost there and two large multi-ton work truckers were stuck ahead of us. One got through, leaving deep ruts wounding the road and bleeding red clay. The other backed down the rise, forcing us over to the shoulder. We tried to climb through twice, each time lacking enough clearance in the small rental car to make it, and ended up backing down ourselves. We found a $20 hotel in town with hot water, then jumped a ride with a 4×4 diesel Toyota pickup first thing in the morning to recover our gear, none the worse for wear. Life in the coffee mountains! The late morning and early afternoon were spent in productive meetings with COMUCAP about plans to buy coffee and to sell aloe vera. They are now fair trade certified by FLO in Germany, so we believe we may have potential customers for them in Canada, if we can figure it all out. The trick for us in coffee is now bringing back crop samples to New Orleans so that our roaster at Fair Grinds can test the quality of various crops and see if we can get others to join us in buying a larger lot of coffee to directly ship to the city. Before this trip is over we will lug 30 pounds of green, dried coffee beans back for roasting to see if we can organize a buying cooperative from the cooperatives, as it were. The devil is in the details though, and we are struggling to get the pricing in line. 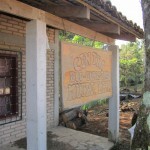 We had run into a fellow I had originally met at COMUCAP on my first visit three years ago, who was now working at another, larger coffee cooperative in Marcala called RAOS. He invited us to take a look at their operation. Wow! We were impressed. It was huge comparatively. 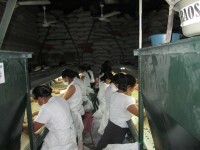 Two shifts of workers, including rows of women sorting out bad beans to ensure the quality and gangs of young men bagging the beans, including fair trade and multi-certified beans, as well as rakers to keep the beans dry, and other workers cupping the coffee in the lab, working the drying machines, and altogether adding up to probably 100 workers employed not as producers but in the final process after the beans left the coffee plantations. 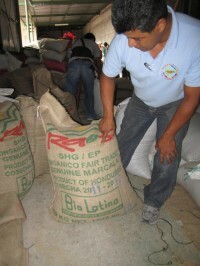 RAOS produces enough coffee to ship 30 containers to various markets. It was encouraging to see how producers could come together to get to the next level! 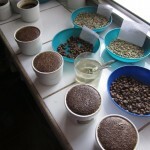 This entry was posted in ACORN International, Coffee and tagged COMUCAP, Fair Grinds, fair trade, Marcala, RAOS by Wade. Bookmark the permalink.